Due to operating problems on East 5th Street in Benicia, the route is currently using 1st Street to East H Street. Stops at Military East and East 4th/East 5th are currently closed. We recognize we need to make some changes to the revised route to ensure it operates on time and are working to determine the best solution. Thanks for your patience! Due to paving work at the intersection of Sacramento Street & Georgia Street, Routes 2 & 6 will be temporarily detoured between the hours of 7:00 AM to 4:00 PM and will not not be serving the Sacramento Street and Virginia Street bus stop. The closest stop is the Vallejo Transit Center. Please plan accordingly. Routes are scheduled to resume regular service Saturday, September 10, 2016. SolTrans buses will not operate on Monday, September 5, 2016, due to the Labor Day Holiday. Regular service will resume on Tuesday, September 6, 2016. Please not that the Route 200 will operate on a weekend schedule. Please use the following link to view our Holiday Schedule for additional information: Holiday Schedule. Track bus locations & service alerts right from the palm of your hand. Get the app! Real-time information for any bus, any route, any stop! *Must close and reopen the android app after install. Will you be using public transportation? Vallejo, Benicia, Fairfield, and Suisun residents can use your event ticket for a free bus pass to and from Food Oasis thanks to SolTrans & FAST. Once at the fairgrounds there will be a shuttle to take you to McCormack Hall. Location of shuttle pickup, is just inside the fairground gates. SolTrans will allow riders to ride free with their event ticket on regularly-scheduled routes to and from the Food Oasis event. Riders must be at stop 5 minutes before bus is due to arrive. Note: There will be a shuttle that can take riders from the Solano County Fairgrounds bus stop to McCormack Hall and back. Look for the signs and volunteers to direct you to the shuttle. (Shuttle schedule below). Ride your regularly-scheduled route to get to and from Food Oasis. 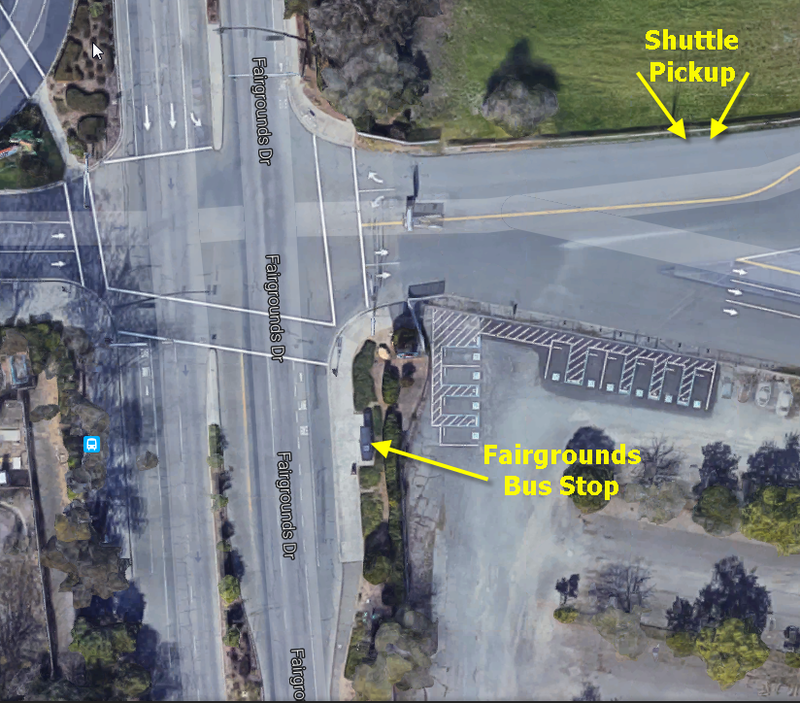 Note: you may need to ride your regular bus to the Vallejo Transit Center to catch a bus that stops at the Fairgrounds. Route 85 leaves the Vallejo Transit Center at 10:05AM, arriving at the Fairgrounds at 10:25AM. Route 5 leaves the Vallejo Transit Center at 10:30AM, arriving at the Fairgrounds at 10:58AM. Route 20 does not operate on Saturdays. However, you can catch Route 78 at 9:32AM (at City Park) to the Vallejo Transit Center, then catch the Route 85 or Route 5 bus (see above) to the Fairgrounds. Unfortunately, to get home you will have a significant wait at the Vallejo Transit Center to catch the Route 78 bus back to Benicia. The bus leaves the Fairgrounds at 1:38PM, arrives at the Vallejo Transit Center at 1:55PM, and the Route 78 to Benicia leaves the Vallejo Transit Center at 2:30PM. Route 78 leaves the Vallejo Transit Center at 2:30PM, arriving at Benicia City Park at 2:46PM. Route 15/17: Friday afternoon trips add 1 minute running time between Seaview/Goldenhill and Military/1st for consistency with the Monday‐Thursday schedule. Route 20: Has been extended to the Sereno Transit Center, and serves Six Flags, Kaiser and Sutter Solano hospitals and improves connections to Route 78. Route 80: The weekday schedule reflects actual running times which have been increased southbound during the morning peak periods, and northbound during evening peak periods. Timed to connect with Transbay trains at BART. Route 85: Running and departures times have been revised to provide adequate running time in both directions. VTC Bus Bay relocations: The bus stops for Routes 3, 6, 7 and 8 at the Vallejo Transit Center have been moved to improve routing. Please check the schedules when planning your trips, as changes in time points may affect your connections. Due to a traffic accident on Eastbound I-780, all lanes east of Lemon St have been closed. Traffic is being diverted off to I-80 eastbound, please expect delays on routes 3 and 78. There is no time estimate for when lanes will reopen. Route 80 may experience delays and will be detoured during the temporary closure of Interstate 80 in both directions. All motorists will be detoured to San Pablo Avenue. Regular service is scheduled to resume after 7:00 am on Sunday, August 21, 2016. Due to the Georgia StrEATS event, the route 1 and route 4 will be temporarily detoured from 4:00 pm to 8:00 pm on Saturday, August 13, 2016. In addition, the stop at Georgia St & Sonoma St will be temporarily closed; please use the Georgia St & Napa St stop instead. Regular service will resume on Sunday, August 14, 2016. To coincide with service improvements, the stops at the Vallejo Transit Center will be relocated for routes 3, 6, 7 and 8. Please look for the signs beginning Sunday, August 21st to ensure you are waiting for your bus at the correct stop.